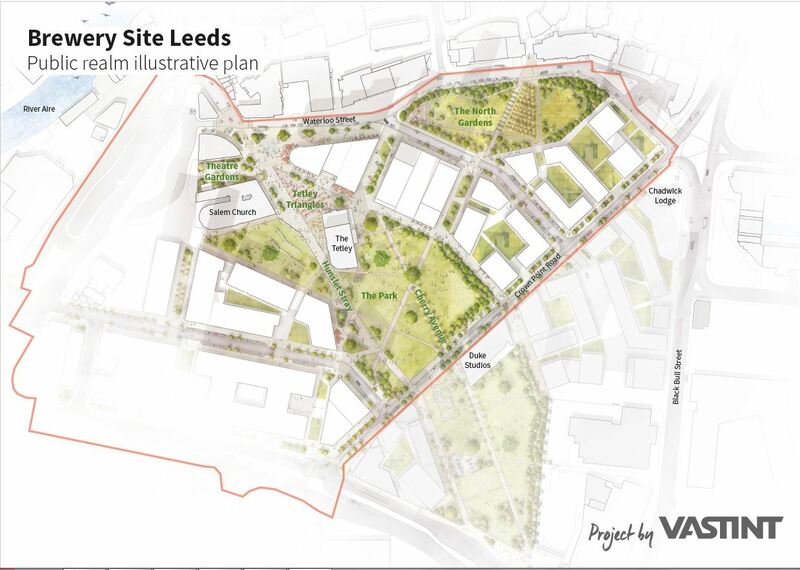 Today Vastint UK gained outline planning permission for the first phase of Brewery Site Leeds. This project makes a significant contribution to a new city park for Leeds which, working with the Leeds City Council, will ultimately connect the River Aire to the education quarter. Vastint UK will now begin the task of delivering an important element of the wider South Bank regeneration vision. The first phase is 6.6 hectares and sits between Crown Point Road to the south, Waterloo Street to the north and Meadow Lane to the east, with The Tetley Building at its centre. Gaining planning permission is an important step in the development process. The team presented initial proposals in 2016 which were shaped by detailed consultations with stakeholders including Leeds Planning Department, local residents and businesses. When the City Plans Panel reviewed the scheme in October 2017, councilllors were extremely positive in their comments about the scheme. 2018 has seen the team negotiate the specific details of the permission with Leeds City Council, as well as undertaking comprehensive traffic modelling to satisfy Highways England. The team has also been progressing the next stages of design of the first buildings and the landscaping of the park that will be submitted for approval in 2019 before construction starts in 2020. Andrew Cobden, Vastint UK Services’ Managing Director said: “The shared vision for the South Bank is to transform a former industrial site into an exciting new part of Leeds city centre. Our 8.5-hectare holding sits at the heart of the South Bank regeneration area, and we are committed to working in partnership with the city council and other partners to deliver a much-needed city park for everyone. “We aim to create a truly mixed-use development with great places to work, live and visit. We hope it will be seen as a great asset to the city when we’ve finished; a popular hub of activity and life set around a generously-sized park which helps to reconnect vibrant areas of the city centre. Vastint UK will bring forward an outline planning application for the land south of Crown Point Road later in 2019. The design proposes a vibrant, mixed-use, park-side neighbourhood at the heart of the South Bank in Leeds City Centre with a generously-sized urban park at its heart. The aim of the scheme is to support the expansion of the city core, providing a vital link connecting the city centre with the Tetley and its creative neighbours, through to the education district and to the communities to the south. A major inspiration for the design was Leeds City Council’s vision to inject new life into this part of the city centre, with particular emphasis on a new park as the catalyst for transforming the area, as detailed in the “South Bank Planning Statement” (2011) and, more recently, in the “South Bank Leeds Regeneration Framework ” (2018). For more information, see www.brewerysiteleeds.com.